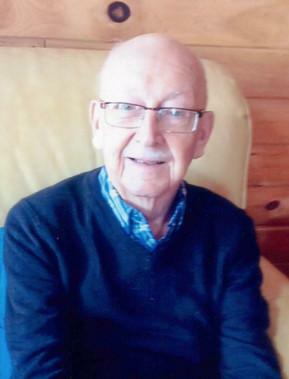 Passed peacefully away at the age of 91, surrounded by the love of his family, William (Harold) Johnston of Goulds. Left to mourn with so many happy memories, his loving wife of 63 years, Margaret (nee Everard). His devoted daughter, Linda and son-in-law, George Rideout. His dearly loved grandchildren, Megan (Marshall), Stacie (Will), and Shaun, also mourning, his sister Eva Walsh, (Jim – deceased), sisters-in-law, Mary Leonard (Cosmas – deceased), Peggy Everard (Gerald – deceased), as well as many nieces and nephews. Special mention to close friends Linda Sullivan and Ted Condon for their support, as well as the St. Kevin’s Saturday choir members. Harold is predeceased by his infant son, Neil, his parents May and Charles, siblings and their spouses; Gordon (Rita), Arthur (Jenny), Alfreda Saunders (Mike), Millie Clowe (John), Kittie Clowe (Joseph), brothers-in-law, John (Dot), Dennis Everard, niece Connie Everard, and nephew Craig Johnston. Harold had a long and happy life with Margaret. Linda, George and their children, were the light of his life. A huge supporter in every way, from cheering at sporting events, to showing us how to cast a line, or simply being our taxi service, Grampa was always there. He and Marg decided three years ago to move to Ruby Manor Retirement Home, from their home in Goulds. Thanks so much to the staff there for their care and support. Very special thank you to the Health Care team Harold relied on, who provided such great care over the last few years. Dr. Gary Rideout, Dr. Patrick Parfrey and the Kidney Care Clinic, Community Health Nurse Sharon Nurse, Pharmacist Andrew Hiscock, St. Clare’s Emergency Department and Medical floors, especially 7 West, who cared for him in his final days. Resting peacefully at Carnell’s Funeral Home, 329 Freshwater Road. Visitation hours will be from 4-9 p.m. on Thursday, February 14 and 2-9 p.m. on Friday, February 15. Funeral service will be held on Saturday, February 16 at 11 a.m. from St. Kevin’s Church. Cremation to follow. Flowers accepted or donations may be made to the Canadian Cancer Society or the Kidney Foundation of Canada. To send a message of condolence please visit www.carnells.com.